What happens when America's favorite pastime and the best-selling card game in the country unite? The official MLB(tm) edition of Spot It! 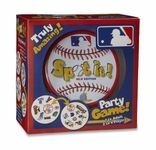 It plays just like regular Spot It!, but with baseball themed symbols. Do you know all 30 MLB(tm) team logos? Fans and rookies alike will have a ball learning them all with this fast-paced game. Whether at home, at the ballpark or anywhere, Spot it and you'll be running the bases to victory!